The Chess House is pitching Giant Chess Sets. 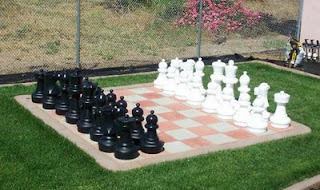 The post includes two pictures which "...show what can be done to make a giant chess set a very attractive part of any landscape." One of the pictures (reposted below) also shows that some people still don't know how to properly set up the board and pieces of their giant chess set. More than 60 youth and adults converged on Christ Baptist Church for the inaugural "Chess for Christ" tournament. "Chess for Christ" is a ministry of "Men for Christ" at Christ Baptist Church, where the Rev. W. Maurice White Jr. is pastor. ...you might want to check out chess on the radio. A piece from current USCF President Bill Goichberg which argues that the current USCF political situation pales in comparison to the period 1996-2001. An interview with Paul Truong regarding local chess promotion. There was a time, not long ago, when a personally produced chess video game or lesson was a unique occurrence. I remember Chris Kilgore's effort a couple of years ago and how impressed I was (unfortunately I can't find it on the web anymore). Chess Strategy has produced two video chess lessons -- the first features the game Taimanov-Bronstein, and the second Addison-Fischer. By the way, if you haven't registered at the site yet, what are you waiting for? In addition to the content on the blog, registered users receive extended lessons via e-mail. I've received two so far and they've both been worthwhile. Besides, it's free! PE's Chess Cast has been listed here for quite awhile, but until recently I never actually watched one of the podcasts -- some pretty weird stuff it turns out. I don't know about all of them but the one I watched has this sock puppet animal talking in front of a demostration board. Whatever helps teach the kids I guess. Manju posted a video covering a very basic K+P vs. K ending. The content won't be of much interest except to beginners, but I never get to hear anyone speaking Dutch around here. J'adoube has posted videos of several of his games recently and this one where he takes on Dennis Monokroussos' anti-French line. Jim is actually a bit unfair to Dennis in the video since Dennis never claimed that his line was a refutation of the defense. In fact, Monokroussos is quite clear that his line is bad if Black plays appropriately. This was originally a multi-part series on Dennis' old blog and when he posts the last part to his new one, you'll see that he offers a multitude of good solutions for Black. All that being said, Jim does a nice job unearthing a key improvement in the variation. My favorite recent video comes from Emily's Chess Blog. Emily's enthusiasm is absolutely infectious and you've got to love that pink and yellow chess board! In other US Chess League news, the Commissioner reports that Dallas and New York will both have new managers for the upcoming season. Of course, manager changes in the USCL aren't exactly the same as in, say, baseball. No one gets fired for team (under-)performance. Instead, the current incumbent gets tired or moves away and then someone new gets suckered into the role. Do I have that right, Matt? If you want to earn an MBA from Virginia's Hampton University you're going to have to learn to play chess. After experimenting with chess in business administration classes for more than a decade, [Sid Howard] Credle[, dean of Hampton University's business school,] formally incorporated it in 2000 into the new MBA program, whose graduates finish with both bachelor's and master's degrees. So who is this Sid Credle guy? Here's his USCF rating card. It's hard to tell from his tournament history where the "past national champion" title came from. Though if you'd like to meet Sid, it looks like you'd have a pretty good shot at it at this year's Foxwoods Open. Ever seen a horse in Queens that didn't have a policeman on it? IM David Vigorito tied for fourth at the just completed NACA 4th North American FIDE Invitational in Chicago. Kevin Croxen had a question of his answered at Susan Polgar's Blog. I don't know much about the Illinois scholastic chess scene other than what I've read at The 64 Square Jungle over the years, but obviously there are issues that need to be addressed. I'm guessing it's all about adult egos, politics and power plays. How else can one explain why the CPS Championship took place the same weekend as the Illinois State K-8 Championship? Let's all try to remember that scholastic chess is supposed to be about the kids. As a BCC member, I've also been asked to post on the blog more often. As for the opening database, I'm trying to find a compelling reason to create another one. What's the point unless you're playing correspondence chess? The tools are there for maintaining opening lines up to move 30 and beyond, but how can non-professionals possibly expect to remember all the variations, much less recite the main lines? Maintenance always seems to clog memorization, much like going to a museum and keeping track of the captions instead of looking at the pictures. Also, the computer purchase cliche applies to opening theory as well -- the moment any analysis is published, it becomes obsolete. I personally have learned more about openings by playing over entire games, where the opening is organically attached to the middlegame and ending, than by entering and saving excerpts. I've long struggled with opening theory, a necessary evil because I have to play professionals in the open sections. Outside my current full-time job, I'll never play more than 50 serious tournament games a year. I still haven't found the optimal medium between studying the principles and memorizing forced sequences; the only answer I've found is making more time for both. Any thoughts from BCC members on this? The US Chess League has awarded the 3rd best game of the 2006 season to the Boston Blitz's Larry Christiansen for his win over Carolina's IM Milman. While ranked fairly highly by the judges, I found their comments on the game somewhat tepid (other than GM "I have no memory at all" Shabalov's). As I remember it, even the titled players in the crowd were saying that Milman's attack would play itself and that he needed only 4 or 5 straightforward moves to bring Larry to submission. Instead, it was Christiansen who unleashed the lightning strike on his opponent's King. It was an exciting game and a very worthy award winner. Forever is a long time, so you never know (see The Chess Mind for a specific example). I trimmed my links to the right because I think that blogs are like TV channels-- you only need a few, and you don't even really need those. The Kenilworthian is like The Learning Channel with all its erudite commentary, Blue Devil is like PBS for his academic treatises on piece activity, EmilyChess is like the Disney Channel for her kid-friendly enthusiasm. Boylston is perhaps like C-SPAN for noting news with varying degrees of relevance. Jim West is like AMC, American Movie Classics, because his articles are old but not outdated. There are also other chessblog channels like the Cartoon Network, depending on your taste. In a follow-up comment, BDK suggested that Chess for Blood was like SpikeTV. I suppose Susan Polgar is like Biography (well, Autobiography actually) and Chess News and Events is like CNN Headline News. Any other suggestions? Fourteen players have turned out for this year's Paramount tournament (6-player 2-RR at slow time controls with adjournments possible). The A-section comprises the standard set of six players, but the B-section has been expanded to eight to accommodate all those who wanted to play. As tournament director Bob Oresick pointed out, the B-section at 14 games per participant is "...as a long as an interzonal match." Does he tattoo key positions on his chest? It's not necessary to have a good memory to excel at chess, [Shabalov] added. "I have no memory at all," he said. I don't know about you, but I find both comments specious. Without memory how can you have pattern recognition? How can you recall opening theory you've studied? How will you even remember the basic rules of the game? With no memory at all, how does Shabalov even know that he is Shabalov?! 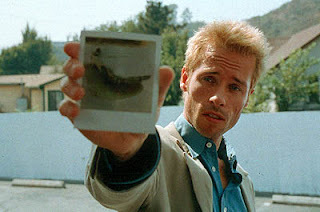 You don't recall the guy in "Memento" playing chess, do you? He encouraged students to learn more by reading books about chess strategies. I'm not sure what point there is in reading if you can't remember what you've read. GM Jaan Ehlvest covered his match with Rybka on this Wordpress blog. I'm not going to add it to the listings since I assume it will end with the completion of the match. The best part so far is about two-thirds of the way down the page where Jaan after losing the first two games posts photographs of himself entering the bathroom. Not surprisingly, his results improved later in the match. How many chess blogs are there anyway? I'd been meaning to get to this topic for quite awhile, but with all the caption contests, chess poems, USCL expansion news, Wamala updates, chess pie recipes and obscure references only marginally related to chess, who can find the time? If you go to google and type "Chess Blog", about 2,130,000 items come up. If you type "Chess Blogs", about 1,760,000 items come up! Don't confuse the number of Google hits with the number of chess blogs. Many of the pages Google is listing probably don't even have the two words next to each other. I would estimate that there are about 250-350 active chess blogs (where active = at least one post in the last 30 days). "Don't confuse the number of Google hits with the number of chess blogs." I believe Susan more than you. "I believe Susan more than you." Then I'm sorry to say that you would be wrong. As a test, go to say page 30 of the Google results for chess blogs and randomly click on one of the listings. Odds are it will not be a chess blog. Thankfully, both Susan and another commenter came to my defense. This number seemed high to me. I typically count about 75 blogs updated in the previous month plus another 40 active in the past six months. Since DG usually knows what he is talking about, I'll have to compare the BCC blogroll with my database of blogs. It occurred to me that I needed to provide some explanation and the methodology behind my estimate. Here goes: While I maintain a database of all the blogs listed on BCC Weblog and continuously update their active/inactive status, I do not assume that I have a complete list of all chess blogs at any point in time. Why? Because new chess blogs are created everyday and on any given day if I want to find a few new ones I have several surefire ways of doing so. In fact, I could probably win a few bar bets with the following proposition, "In the next two hours, I bet I can find 5 chess blogs you've never seen before." Any takers? OK, so if my database isn't complete then I need to estimate how much of the total universe of chess blogs it likely represents. I put boundaries on the problem -- it seems to me unlikely that there are 50% more chess blogs than I have in the database (i.e., I have found only about 2 of every 3), but reasonably possible that I'm short by 20% (i.e., I've found close to 4 of every five). One can certainly quibble with my estimates, but I think they are plausible. Now at the time of Susan Polgar's original post I had ~ 220 active chess blogs listed. 220 + 20% = 264 and + 50% = 330, so that's how I came up with the 250-350 estimate I used in my comment. Where do we stand today? I currently have 243 active chess blogs in the listings. Using the 20-50% methodology results in a current estimate of ~ 290-365. Mark also suggested that another difference between his list and mine might be that he only tracks English language chess blogs. Certainly non-English blogs (and here I mean the language, not blogs written by people with good dental hygiene :) ) do constitute a sizable part of my database. Of the current 243 active chess blogs, 86 are not written in English while 157 are. How do I know when an inactive blog is reactivated? I don't. I trust that someone maintaining an active blog will post a welcome back message or refer to one of the newest posts in a dialog. I have a solution for this problem. In Bloglines I keep a folder of RSS feeds for all the Inactive chess blogs. If they start up again, their posts pop up immediately. However, I wait until they've posted at least twice in 30 days before moving them back to Active status. The players according to coach Akintola normally have two hours of physical training every morning and by next month, the players would be on special diet with more of fruits which [NCF] chess president [ACP Sani Mohammed] said will eliminate stress-causing acids. "If we put the athletes o[n] fruits meals daily between from morning till midday, it helps to give instant energy and eliminate waste just as it increases body metabolism," he explained. As a BCC member, I've been asked to step up and post on the blog more than I currently do (which is never). Unfortunately, I'm still figuring out how to use chess-viewer, which means I have to annoy everyone with my crude notation. Hopefully I'll learn some blogging skills soon; in the meantime, I'll beg your indulgence and pose the following openings question. Last night on ICC, I saw a strong GM play the line 1.d4 d5 2.c4 c6 3.Nf3 Nf6 4.Nc3 e6 5.e3 Nbd7 6.a3!? Bd6 7.g4!?. 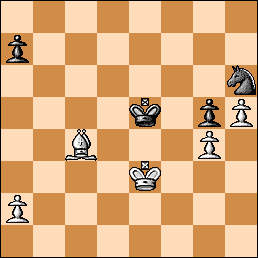 This is analogous to the "Latvian Gambit" in the Meran, with the difference that White has played a3 instead of Qc2. 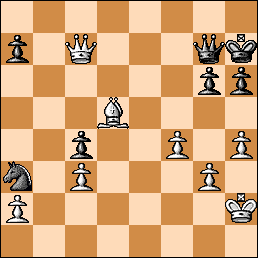 The question is, can White also get an effective version of this gambit by playing 6.Bd2!? Bd6 7.g4 ? 1) In comparison with the 6.Qc2 line, White is not hitting the h7 pawn, which may improve some of black's defenses based on Nxg4, i.e. 7..Nxg4 8.Rg1 Nxh2 9.Nxh2 Bxh2 10.Rg7 and now black can play 10..Qf6 without dropping the h-pawn. In addition, White is not yet on the c-file, which might make black's ...e5 break (commonly met with cxd5 and Nb5) more palatable. On the other hand, defenses based on ..dxc4 followed by ..e5 allow White to play Qb3 without losing a tempo: 6.Bd2 Bd6 7.g4 dc 8.Bxc4 e5 9.Qb3 with the idea of 9..0-0 10.g5 and the d5 square is now unavailable (Black can sac a pawn on d5, but I doubt it's good). 2) In comparison with the 6.a3 line, White is one move closer to castling queenside or to bringing a rook to c1, depending on the circumstances. On the other hand, Black is able to play a defense based on ..Bb4, which I personally think is one of the better tries against the g4 gambit. 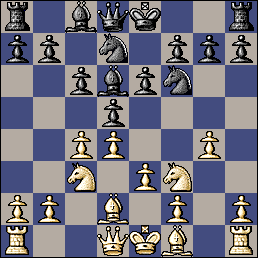 For example, a common position is 6.Qc2 Bd6 7.g4 Bb4, where white usually plays 8.Bd2. So the question becomes, after 6.Bd2 Bd6 7.g4 Bb4! ?, does white have anything better than 8.Qc2 transposing into the above line? 3) The GM who played 6.a3 was using it in a 3-minute match, so all this may be irrelevant (for what it's worth, he had a great position out of the opening and converted it to a win). Anyway, I think 6.Qc2 is still the best move order to get into the g4 gambit, but I don't see why 6.Bd2 is any less useful than 6.a3. Food for thought. p.s. Random survey -- if I can learn how to use Chessviewer, would people be interested in more of these types of posts? Temposhlucker's decision to go on (permanent?) hiatus from the ranks of the Knights Errant is a monumental loss, perhaps second only to the day that Don Q did the same. Losing Goran at Chess News & Events was tempered by the fact that he continues to post at Chess Strategy. Since then, things have improved further with a new blogger taking over the reins of the original blog. Patrick at Chess For Blood has decided that he is "due for a break from chess and chess blogging for awhile" and the Underpromoted Knight has decided to make school a priority over chess. Then there is the case of Strong In Mind's Fierabras. About Chess gave you the facts, but only here will you find the story behind the story (thanks to a tip from an unnamed Knight). As many of you may be aware, J'adoube has been advocating the somewhat provocative position that endeavoring to play moves highly rated by top chess computers (specifically Rybka in his case) is a good path to improvement. This has resulted in some healthy and spirited debate across several posts. However, it seems that somewhere along the way Fierabras' and J'adoube's point counter-point turned heated, personal and anything but healthy. Shortly thereafter Fierabras announced his intent to leave the Knights. It isn't too hard to connect the dots. Now, I'm certainly not here to point a finger of blame at anyone. You can read the thread and draw your own conclusions. In fact, I believe that a bit of controversy can often be a good thing in terms of generating interest and readership. Nevertheless, as a general rule it would be hard to go wrong taking to heart Sancho's previous "Can't we all just get along" appeal. Update (3/7): Comment threads at J'adoube's blog are not currently no longer available. Reykjavík, Iceland has declared itself the chess capital of the world. Care to declare your city or town the world capital of something? It's been over a year since I first advocated the use of deli food to name US Chess League teams. While we've yet to see the Boston Blintzes or New York Bagels come to fruition, I am happy to report that one of the 2007 expansion teams has taken up the challenge. 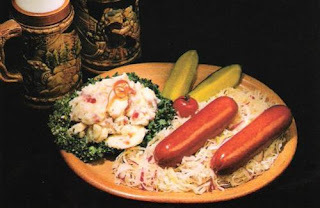 I'm extremely pleased to introduce the New Jersey Knockwursts. One of the most fun tournaments for me in 2006 was the double-round robin Paramount, held at the Boylston Chess Club. I bring a highlight from my games, just to bring attention to the unique situations the Paramount can offer. Pre-game prepwork was nothing new for me, but I had never had an adjourned game in 15 years of tournament chess. In Clayton-Rihel, Paramount 2006, I had my first adjourned position, and I was able to turn a depressing loss into a miracle draw, thanks to my home analysis and a little luck. The following position occured at move 40, when Kyle sealed his 41st move. For those playing along at home, this position looks hopeless for Black on almost all White moves. Up a pawn, White cruises with almost any queen move (Fritz calls it +4.7), and I thought about calling Kyle to resign on the spot. Yet, there was one move that looked natural enough to play over the board -- the simplifying 41. Qxg7. When analyzing at home, I saw a faint glimmer of hope in this line.... just a faint one. Given the tense time scramble we had just played, I gave Kyle a 20% chance of playing that very move. When we reconvened later in the week, I vowed that I would resign on the spot if Kyle had sealed any normal move other than 41. Qxg7. When I sat down over the board and ripped open the sealed move, I was so thrilled to see 41. Qxg7 that I immediately left the board, canceled my dinner plans, and sat down to defend a bad position with my last idea, one cooked up from home. My idea in full bloom. The whole point of my previous moves was to work my knight to h6, where it hits the pawn on g4 and blockades the position together with my king. This situation was not forced, but even Fritz will often let it happen. I love this position because 1) I worked out this exact idea at home, 2) Without adjournments, I doubt I would have come up with such a cool blockade over the board and 3)Fritz still gives White a large winning advantage, all the way to the end of the game, when a draw is certain. 54.Kf3 Kd4 55.Bb3 Kd3 56.Be6 Kd4 57.a4 Ke5 58.Bb3 Kd4 59.Bc2 Ke5 60.Bd1 Kd4 61.Be2 Ng8 62. Bb5 Nh6 63.Bd7 a5 64.Be6 Ke5 65.Bb3 Kd4 66.Bd1 Ng8 67.Bb3 Nh6 68.Ba2 Ke5 69.Bc4 Kd4 70.Bb5 Ke5 71.Bd7 Kd4 72.Bf5 Ng8 73.Bh7 Nh6 74.Bg6 Ng8 75.Bf7 Nh6 76.Bb3 draw agreed. Of all my chess games, this one ranks as one of my absolute favorites. It was also a great moral victory (a moral draw?) for me and turned my tournament around. I went on to finish well, including a nice win against FIDE Master Chris Chase. So, come and play this Monday! This Monday is the start of a very unique event on the Boylston Chess Club calendar. The 8th Annual Paramount, an original brainchild of former BCC president Bryan Clark, is a 10-week double round robin at slow time controls. Players are formed into groups of six by rating and each competitor plays their five other opponents once as White and once as Black. The groups ensure that players get consistently competitive opponents throughout the course of the tournament (unlike some Swisses where a win against a player rated 400 points below you is often followed by a game against a player 400 points above). Since your schedule is known for the tournament after the first round, pre-game preparation can take on added significance. What does your opponent play against your favorite opening and will he stick with it this time or try to change things up? Also, the time controls of 40/2, SD/50 are the longest on the current BCC schedule and provide the opportunity for adjournments. Rather than ruining a well played game by being forced to blitz through the endgame at the end of the night, you just might get the opportunity to study the position in depth at home and return later to realize the fruits of your effort. Your usual monthly Swiss will always be there, so why not try out something different? Play the Paramount! Monday, March 5 – May 7: 8th Annual Paramount 10 Rounds, 2RR, Players divided into six player sections by rating; 40/2, SD/50; Entry fee: $24, $17 to BCF members; Prizes: 50% EF Registration: 6:00 to 6:45 PM Rounds at 7PM. 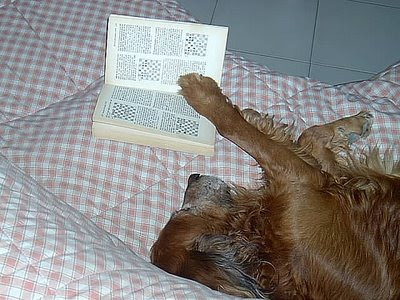 A: Inside Information -- The cat isn't really all that good at Chess. The last time they played best of five, Clinton won three games to two.